From Los Angeles to Toronto, from Miami to Seattle, Tesla has been taking a fleet of its new 2012 Model S sedans around the country to offer short test drives to 5,000 current depositors and potential owners. Those individuals have to be patient as the company slowly ramps up production of the all-electric luxury sport sedan, following delivery of the very first production car in early June. But the short drives should keep many potential Model S buyers interested in the promise of the electric car with a 265-mile range rating from the EPA. Fourteen of the planned sixteen cities on the “Getting Amped Tour" have now been completed. The tour started in Fremont, California, at the assembly plant that Tesla Motors [NSDQ:TSLA] bought two years ago from Toyota. Last weekend, the tour returned to Palo Alto, California--the heart of Silicon Valley--before finishing up in Austin (August 15-16) and, finally, Dallas (August 18-19). Depositors are scheduled in groups of four to six at about half-hour intervals. Each driver may bring up to two guests for the test drive, but every drive has a Tesla chaperone in the front passenger seat. 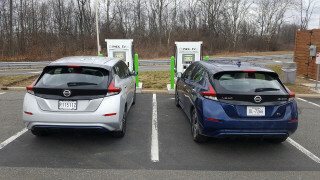 The drive itself is limited to about 7 or 8 miles, but is preceded by a brief and well-done group introductory lecture that introduces the emotional experience of electric driving. Potential buyers can review their color and option choices with better color renditions than on the company internet site. 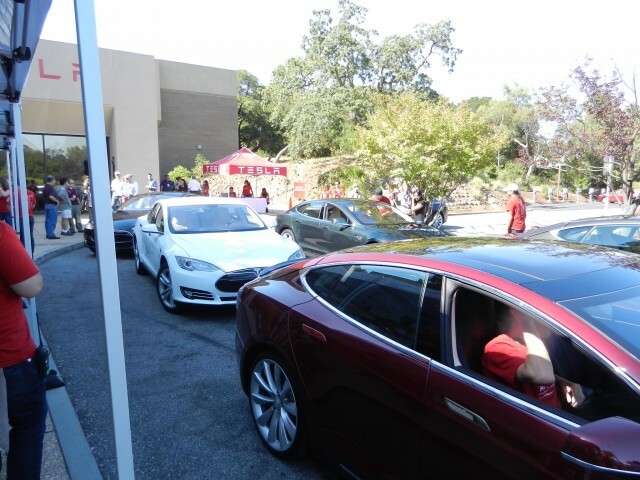 Tesla even offers refreshments, ice cream, and a play area for children at its venues. At the recent Palo Alto venue, at least eight early production cars were available for inspection. Two cars were inside the display building for full viewing and inspection, and another six cars made up the ride-and-drive fleet. Interested depositors were offered the choice of the standard or performance powertrains when they took their test drive. 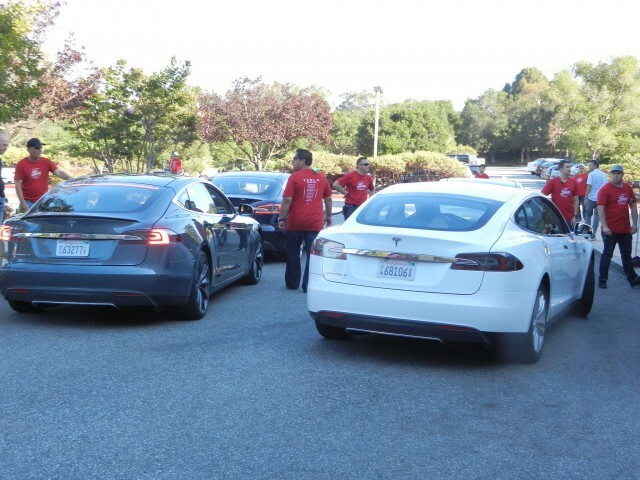 The Tesla chaperones encouraged getting drivers to take advantage of the “full feel” of the car’s torque and power after almost every stop sign. It was far too short a real driving experience for a proper assessment, of course, but there is no question that this vehicle has real power off the line, and corners well. Is the current version of the 2012 Tesla Model S a $100,000 car? It still needs some refinement if it wants to be truly feature-competitive with the established players in the luxury performance category. But there is no other car that offers combination of luxury, performance and environmental consciousness. George Parrott is an emeritus professor of psychology at California State University in Sacramento. He owns a Nissan Leaf and a Chevrolet Volt that are recharged largely on solar power, and is considering the purchase of a Tesla Model S.